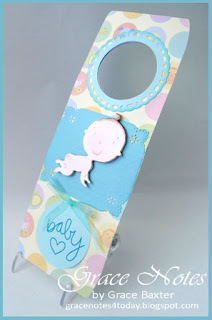 Double-sided Baby Door Hanger, created by Grace Baxter. Be sure to see the coordinating baby gift bag. Every baby nursery needs a door hanger to give the "Shhh" warning, letting visitors know that baby is sleeping. 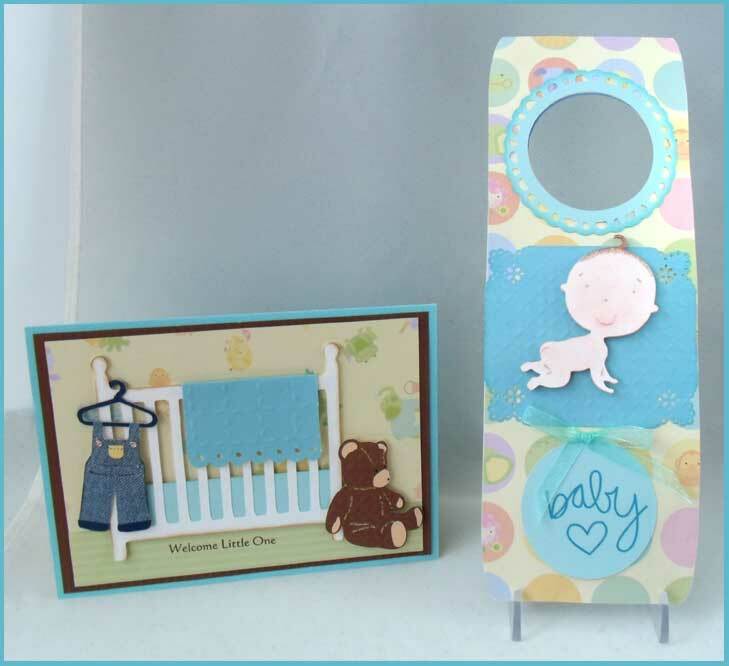 I've made mine double sided, with the opposite side showing a baby, up and ready to play! I also made 2 diapers as options (to cover baby's bottom, if modesty is an issue). Each one has a glue dot on the back, for convenience. But judging by the smiles I saw as this wee gift was passed around at the shower, I doubt the diapers will get used. 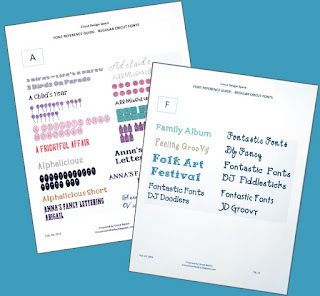 Overall length is about 11 inches. Hanger is cut from 2 layers of white cardstock. Each layer is decorated in its own colour scheme. I did this on purpose, so that it will go with whatever shade of blue they decide to paint the baby's room. As it turns out, they have now painted it aqua. Perfect! The "Awake" side features baby crawling on his quilt. He's up and ready to play. This side features the signage, "Shhh, Baby Sleeping" I created this on the computer using a special font. The baby door hanger was made to match the shower card; the teddy bear is on both pieces and coordinating papers are used. See the next posting for details about the card.